A piece of walnut squared up to precise dimensions with handplanes. Hot on the heels of teaching free classes at the New England Home Show this past week, a new opportunity has come up. I'll be a "featured demonstrator" at the Northeastern Woodworkers Association's 22nd Annual Woodworker's Showcase in Saratoga Springs, NY, March 23-24. Rob Porcaro, author of the Heartwood blog, had been scheduled to demonstrate, but he had to cancel, and very kindly suggested my name as a replacement to the organizers. Thanks for thinking of me, Rob! This is a big show featuring exhibits by professional and amateur woodworkers, demos and presentations, paid classes, and vendors. Lie-Nielsen will be having one of their Hand Tool Events. Tico Vogt and Matt Bickford, who I know from past Hand Tool Events, will be there. Garrett Hack, one of my favorite woodworkers, will be teaching a class. Plus many more. People have been telling me about this show for a while, so I'm thrilled to be a part of it. I'll be doing two hand tool demonstrations each day, one on basic skills, one on advanced skills. Chips will fly and audience participation is encouraged. Four cabriole legs in various stages of completion. 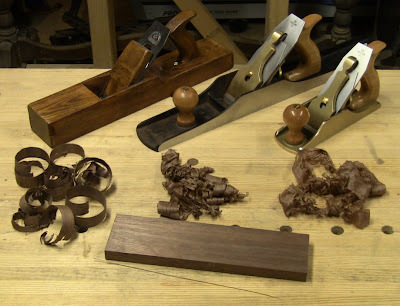 The basic demo will be precision stock preparation with handplanes. I'll show how to take a piece of rough stock to precise width, thickness, and length using scrub plane, jack plane, jointer, and smoother, with assistance from a shooting board, the precision secret weapon of hand tool woodworking. I'll cover the differences between the planes, their setup, and their use. 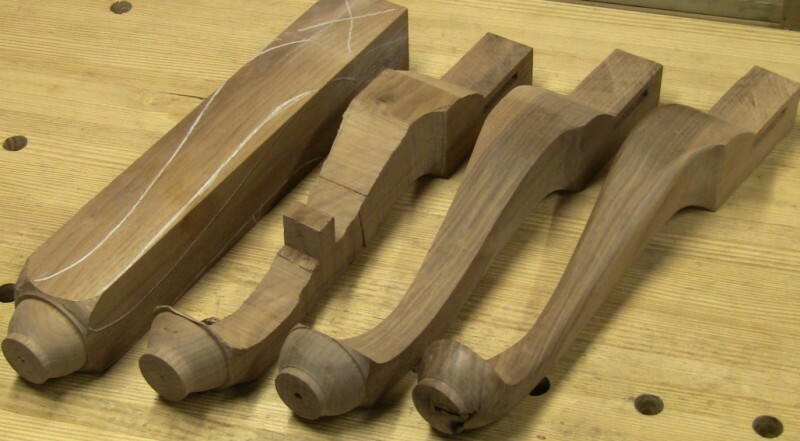 The advanced demo will be making cabriole legs using only hand tools. I'll show several different methods for roughing out the shape starting from squared up blanks, depending on the tools you have available, then the methods to refine the shape to the final graceful compound curves.